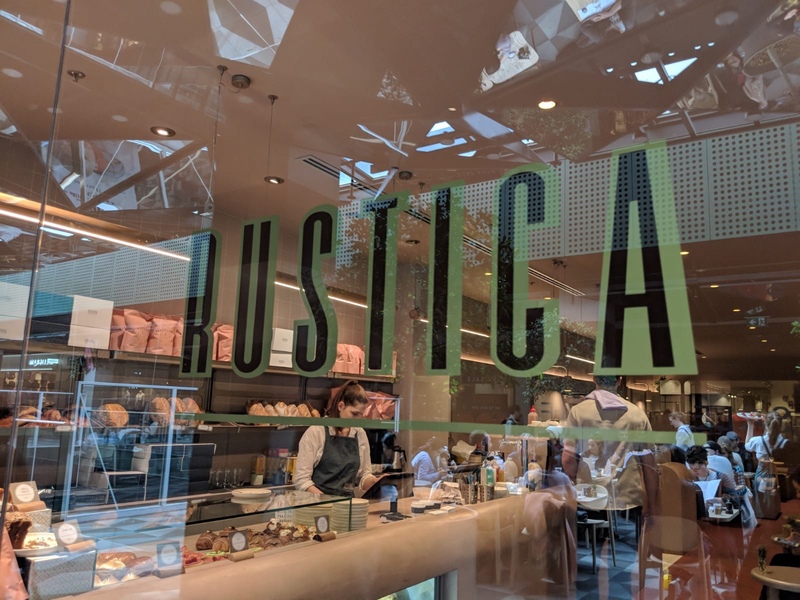 A couple outlets, Rialto and Melbourne Central – we went to the Melbourne Central one. Had to try their plain croissants. Dense but crispy on outside and surprisingly doesn’t fall into bits and pieces. Their soy matcha latte was not bad. A bit milkier than what we preferred. Latte was good. J had baba ganoush, $21 – grilled halloumi, roma tomatoes, poached eggs, greens, sumac salt and quinoa, soy, linseed sourdough. This dish had nothing to fault. Everything was good for anyone who doesn’t want to have anything heavy or meaty. I ordered their lobster eggs Benedict, $22.50. The lobster meat was nicely cooked but the flaw was the excess of chive butter, which made the lobster meat salty. The milky brioche bun was already coated with a sheen of butter. So it felt oily and a bit too salty. The kale hollandaise was mild which made the dish a bit better. Overall, we had a good time, interior was very modern and sleek. Very comfortable sitting inside and outside. I’ll revisit to try their cronuts!